Our first-ever hairspray with bamboo extract and anti-humidity protection for 24-hour, bounce-back hold and natural, healthy-looking movement - even in 90% humidity. Selected for its strength, suppleness and resilience, bamboo bends but never breaks. This formula keeps you in control of your style with frizz control and bounce-back hold that lasts all day. WHAT IS FULL CONTROL HAIRSPRAY? 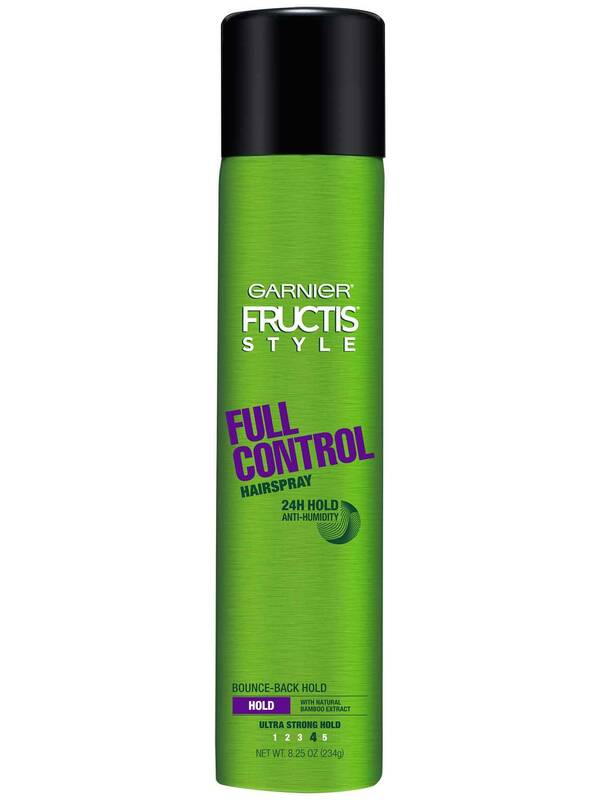 Garnier Fructis Style Full Control Hairspray is a versatile hairspray that gives you ultra strong hold over any style - even with moisture in the air - all day, every day. Hold can 10-12 inches from hair and spray in even, all-around motion. 1059751 C AQUA / WATER / EAU, DIMETHYL ETHER, ALCOHOL DENAT., POLYESTER-5, POLYURETHANE-6, PARFUM / FRAGRANCE, GLYCERIN, LIMONENE, HEXYL CINNAMAL, LINALOOL, ETHYLHEXYL METHOXYCINNAMATE, CAPRYLIC/CAPRIC TRIGLYCERIDE, AMYL CINNAMAL, BAMBUSA VULGARIS EXTRACT. F.I.L. D47285/2. Rated 1 out of 5 by A Demore from Stopped spraying I like the hold for a hairspray, but have stopped using it because I bought 4 cans and three of them stopped spraying when about half empty. Rated 5 out of 5 by doahdancer from perfect for dance The smell of this hairspray is really nice and not strong and overpowering like other hairspray. It holds really well. Excellent for dance competitions/recitals, sports, or everyday. When you brush it out your hair actually feels soft. Rated 3 out of 5 by Nursejackie72904 from Could be better I love the smell of this product but downside is it makes my scalp dry and itchy. It did hold my fly aways down though. Rated 5 out of 5 by tabbyimran from A Must Have! 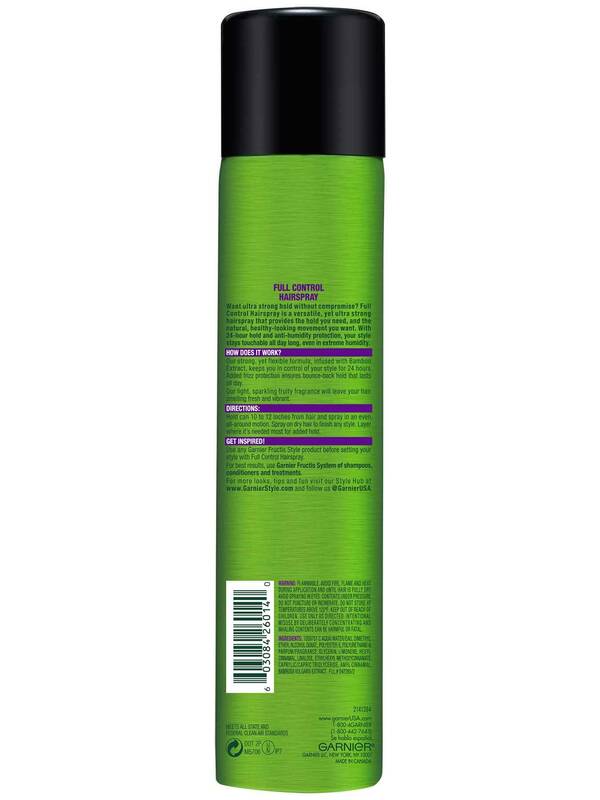 I have used a lot of Garnier's product and recently got to try this hairspray. Since I have curly and frizzy prone hair and also the fact that we have high levels of humidity in Georgia, hairspray is a must for my hair on a daily basis. This product kept my fly aways under control and tamed which has always been an issue for me. It also left my hair feeling smooth and silky and the product smelled great! Goes on nicely and does not make your hair sticky at all. A little hairspray goes a long way. Definitely did not require touch ups the entire day. I am very pleased with this product. Rated 5 out of 5 by Kryptonitexo from Unbeatable product Personally I don't use a lot of hairspray because of the way it makes your hair feel. This product leaves your hair soft and able to move and bounce freely while still controlling it. 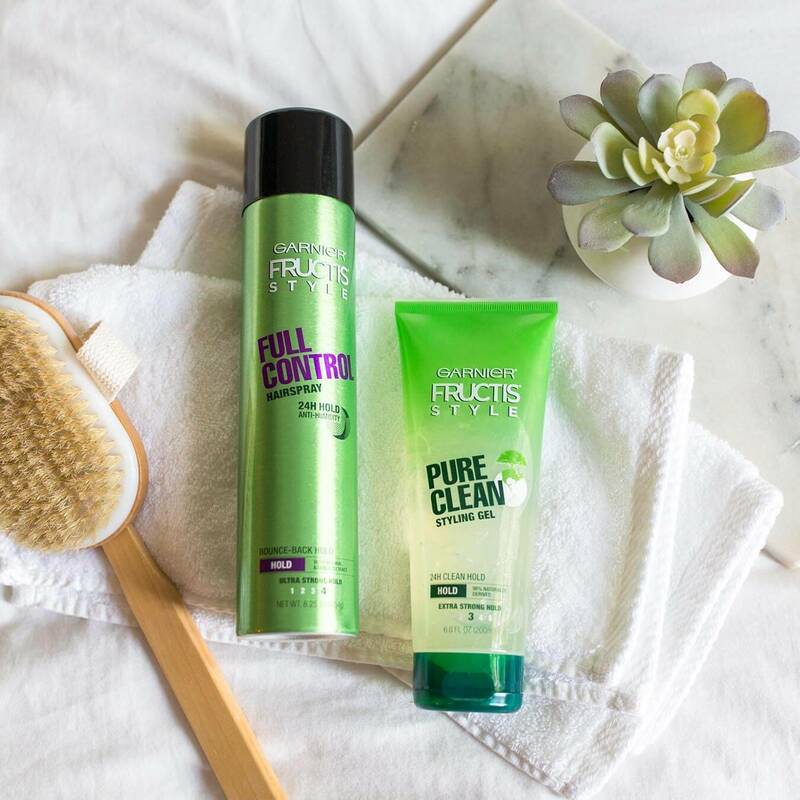 Garnier Fructis doesn't let you down with this product. It smells amazing and hold last all day. Also does a really great job of taming frizz! Rated 5 out of 5 by nacluo from Good, non sticky, hold I love most of Garnier Fructis hair products. They have a nice smell, not an overly chemical or perfume smell like some others. They hair spray in the pump bottle is nice. Easy to travel with because its not an aerosol and you can control it better while applying to your hair. The hold is the perfect amount for me. I have very curly hair that, like most curly hair, tends to frizz out in hot, humid weather or just when you want to look your best. After making my self look as good as I can get, I squirt a few pumps on my hair to hold everything in place. It does not get sticky or stiff, just a simple, nice hold. Rated 5 out of 5 by NikiDphoto from Absolutely amazing! I wasn't sure how I would feel about this product but I was pleasantly surprised. From controlling frizz while my hair was up to maintaining style when down this hair spray went above and beyond. Rated 4 out of 5 by ceerenee from Works really well! I am loving this hairspray. I have always struggled with frizzy hair especially with humidity. I have been using this to not only hold my waves in my hair in place but for the humid control. It definitely keeps my hair in place for hours on end and my hair is practically frizz free with it!